You need to replace this lost fluid to stay healthy. If you don't get enough water, you could become dehydrated. If you get very dehydrated, your body no longer has enough fluid to get blood to your organs. This is dangerous. Do you have to drink only water to stay hydrated? All liquids help you stay hydrated. Water is usually the best choice, because it's almost free (if you're drinking tap water) and has no sugar or calories. But most healthy people can get enough fluid through the beverages they consume every day. These can include water, fruit juices, coffee, sodas, iced tea, and other drinks. Experts say that it's not true that beverages that have caffeine—such as coffee, tea, and cola drinks—always dehydrate you. Healthy people who consume moderate amounts of caffeine don't lose more fluid than people who don't have any caffeine.footnote 1 Try to limit the amount of caffeine you have to 400 milligrams a day.footnote 2 That's about four (250 mL) cups of coffee. You also get water through food. Some fruits and vegetables contain a lot of water, such as watermelon and lettuce. 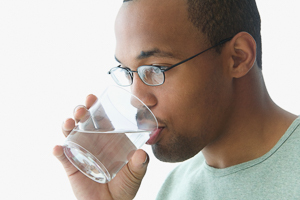 A common recommendation is to drink six or eight 250 mL (8 fl oz) glasses of water or other fluid every day. But some adults may need more or less, depending on how healthy they are, how much they exercise, and how hot and dry the climate is. How can you tell if you are drinking enough water? The easiest way to know if you're drinking enough fluid is to look at the colour of your urine. If you're drinking enough water, your urine will be clear or pale yellow. A darker yellow means you aren't drinking enough water. People who drink enough water also usually have soft bowel movements. Hard bowel movements or constipation can be signs that you aren't getting enough water. If you have any health problems, always talk to your doctor before increasing the amount of water you drink. You may need to limit your fluids if you have certain health concerns, such as kidney problems or heart failure. It can be dangerous to drink too much water. But it's rare that anyone drinks too much water. The risk is highest for people who do endurance sports, such as running marathons. Too much water is dangerous because it would dilute the amount of sodium in your body. This imbalance could cause serious problems, such as confusion, seizures, and coma. Experts advise athletes who do intense activity to drink a sports drink that contains sodium, other electrolytes, and some sugar. Most people don't need sports drinks if they are exercising for less than an hour in moderate temperatures. Plain water is fine. But experts do recommend sports drinks if you're playing sports or doing other intense physical activity for more than an hour. Keep a cup or water bottle by your desk at work. Take several sips of water each hour. If you don't have a desk job, carry a container of water with you, and take sips throughout the day. If you get tired of drinking plain water, add a packet of sugarless flavouring to your water. Or put a slice of lemon or lime in plain or sparkling water. No. A lot of plain bottled water is just tap water that has been purified. It's your choice how you want to drink water. If you like bubbly mineral water, drink that. If you like the idea of vitamins and electrolytes in your water, you can find several varieties of enhanced water at the store. If you don't like the taste of your tap water, or if you just want to be extra careful, you can purify tap water at home. Water filters are available in many stores. Grandjean AC, et al. (2000). The effect of caffeinated, non-caffeinated, caloric, and non-caloric beverages on hydration. Journal of the American College of Nutrition, 19(5): 591–600. Government of Canada (2013). Health Canada reminds Canadians to manage their caffeine consumption. Available online: http://healthycanadians.gc.ca/recall-alert-rappel-avis/hc-sc/2013/34021a-eng.php. Grandjean AC, et al. (2000). The effect of caffeinated, non-caffeinated, caloric, and non-caloric beverages on hydration. Journal of the American College of Nutrition, 19(5): 591-600.